By no means am I a home décor guru. In fact, I am quite intimidated by grown-up spaces. But kid rooms? Now, that is another story. I am still not a pro, but I do have a lot of fun with it. I feel like kid spaces are so much more forgiving. You can pop all kinds of color and whimsy into a design, and mismatch only adds to the fun factor. I love the way Amelia's Cinderella bedroom and Andrew's Mickey Mouse head bedroom both turned out. Both show off that Disney charm but neither goes over the top with cartoon characters. If you want to design a perfectly fun and functional playroom, here are a few things you should not forget. I was inspired by my recent visit to IKEA for their 2015 catalog reveal. Yes! The 2015 catalog is out now! 300+ pages of ideas, beauty, and smart solutions. (1) Toy storage - Toys + kids + playtime? That equals a big mess in my house. Toy storage that is too difficult for a small child won't be used. Find toy storage that is simple to use, like open bins and cubbies. I believe that IKEA is one of the best sources of smart storage solutions. I'm often checking the IKEA website to find the next solution for whatever clutter I may be tackling at the time. 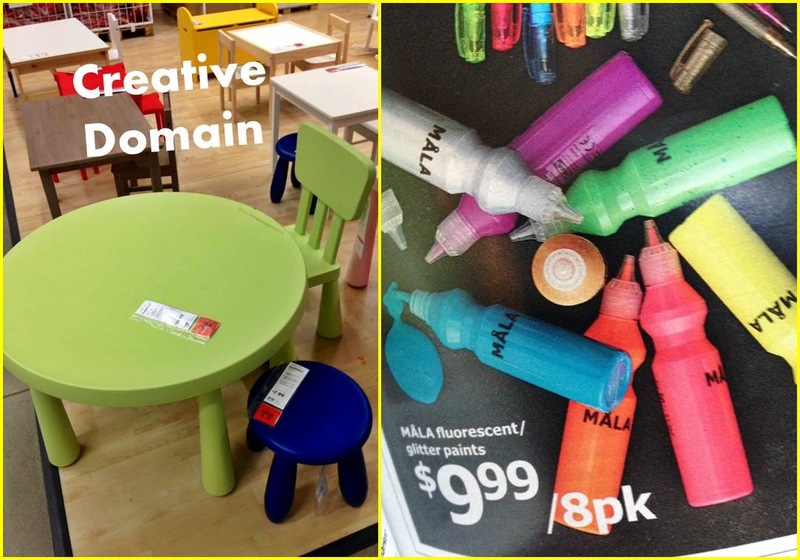 (2) Creativity space - Children need a space to get messy. Crayons, markers, paint, and glue are used almost daily here. We love our round plastic table from IKEA because it looks cute and is easily cleaned when Amelia has been creating masterpieces. (3) Playthings that spark imagination - Sometimes a child needs to be challenged to use his/her imagination. I love "old-fashioned" toys that require play. Toys do not have to dance and sing and play music all the time; an old wooden castle made from simple stacking blocks can spark an imaginary adventure. No batteries or charging cords needed! IKEA has quite a few items like this from play food, to castle tents, to building blocks, and stacking toys. (4) Pops of soft texture on the floor - Kids play on the floor. They roll around, wrestle, and sit with toys and books. 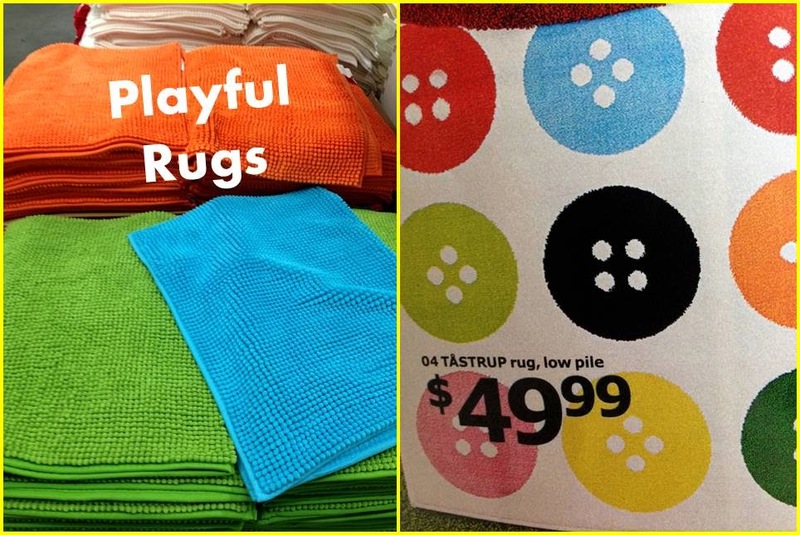 Even if your home playspace has carpet, a great playroom always has an extra-cozy rug or two. A few of these laid in the corner of a playroom would make a comfortable and colorful reading and playing nook. The 2015 IKEA catalog is out now! It is full of inspiration for your home. Big or small, cluttered or neat, contemporary or transitional, there is something fantastic you can use. ENTER TO WIN AN IKEA GIFT CARD WORTH $100! I attended an IKEA catalog party and received a gift card. However, all opinions are 100% mine. IKEA photos taken in-store and from the 2015 IKEA catalog.